We describe an ovarian fad pad transplantation assay suitable for studies of normal and transformed epithelia of the female reproductive tract. The mouse fat pad allows transplantation of large tissue fragments, is easily accessible for surgery and imaging, and provides the most favorable native environment for tissues of Müllerian origin. Flesken-Nikitin, A., Harlan, B. A., Nikitin, A. Y. Transplantation Into the Mouse Ovarian Fat Pad. J. Vis. Exp. (115), e54444, doi:10.3791/54444 (2016). Orthotopic transplantation assays in mice are invaluable for studies of cell regeneration and neoplastic transformation. Common approaches for orthotopic transplantation of ovarian surface and tubal epithelia include intraperitoneal and intrabursal administration of cells. The respective limitations of these methods include poorly defined location of injected cells and limited space volume. Furthermore, they are poorly suited for long-term structural preservation of transplanted organs. To address these challenges, we have developed an alternative approach, which is based on the introduction of cells and tissue fragments into the mouse fat pad. The mouse ovarian fat pad is located in the immediate vicinity of the ovary and uterine tube (aka oviduct, fallopian tube), and provides a familiar microenvironment for cells and tissues of these organs. In our approach fluorescence-labeled mouse and human cells, and fragments of the uterine tube are engrafted by using minimally traumatic dorsal incision surgery. Transplanted cells and their outgrowths are easily located in the ovarian fat pad for over 40 days. Long-term transplantation of the entire uterine tube allows correct preservation of all principle tissue components, and does not result in adverse side effects, such as fibrosis and inflammation. Our approach should be uniquely applicable for answering important biological questions such as differentiation, regenerative and neoplastic potential of specific cell populations. Furthermore, it should be suitable for studies of microenvironmental factors in normal development and cancer. Transplantation assays, which involve the introduction of cells and tissues into specific body sites in mice, represent an essential approach for studies of tissue regeneration and carcinogenesis. Orthotopic transplantations of cells, that is, their placement into a native milieu, are particularly important for characterization of adult stem cells. The existence of mammary stem cells was first suggested by the transplantation of epithelial mammary gland fragments into gland-free mammary fat pads of mice1. Engraftment assays to humanized mouse fat pad2 were used to recapitulate the regenerative potential and normal development of human primary breast epithelial cells. Moreover, serial and limiting dilution transplantations of phenotypically distinct cell types into the cleared mammary fat pad were crucial to test the self-renewal capacity and multilineage differentiation of mammary stem cells3-5. Transplantation assays in combination with genetic lineage tracing provided evidence of the cell of origin in mammary carcinogenesis5. Kidney capsule transplantations are commonly used for testing properties of putative prostate stem cells6. Orthotopic transplantation of normal and neoplastic mouse and human pancreatic organoids revealed genes and pathways altered in cancer progression7. The importance of the native environment has also been supported by the demonstration of diverse regeneration after engraftments of sweat glands into different locations, such as mammary fat pads, shoulder fat pads, and back skin8. The peritoneal cavity and the ovarian bursa are usually used as places for orthotopic transplantation of epithelial cells of the female reproductive tract9-12. Both of these methods have a number of limitations. Intraperitoneal injection of cells leads to their implantations in different areas of peritoneal cavity, thereby complicating monitoring cellular growth. Furthermore, variations in the microenvironment, such as the extent of vascularization, innervation and immune cell representation, may be quite significant in different areas of the peritoneal cavity. The ovarian bursa has a very limited volume, allowing injection of no more than 10 µl of liquid. This significantly limits the amount of cells that can be administered. Furthermore, injections into the ovarian bursa can be quite technically challenging and the procedure requires a significant amount of time. To address these limitations, we have taken advantage of the ovarian fat pad properties. The mouse ovarian fat pad has a large size, is adjacent to the ovary and the uterine tube, and is easily accessible by surgery. It has been reported that equine trophoblast can be transplanted into the mouse ovarian fat pad13. However the details of this method were not described. It was also not reported if this method can be applied to adult cells and tissues. Here, we describe a reliable approach for the transplantation of mouse and human cells of the female reproductive tract and show that this method is also applicable to long-term organ transplantation. All the in vivo work described is approved by the Cornell University Institutional Animal Care and Use Committee. Euthanize donor 6- to 8-week-old virgin β-actin-Enhanced Green Fluorescent Protein (EFGP) or β-actin-Discosoma Red Fluorescent Protein (DsRed) mice by CO2 administration followed by cervical dislocation. Verify successful euthanasia by a toe pinch. Place an individual mouse on an absorbent drape, ventral side up, and then wipe the abdomen with 70% ethanol. Open the skin by making a lateral incision at the body midline and with fingertips pull the skin above and below the incision toward the head and tail of the mouse. Hold the peritoneum using blunt forceps and make a cut with fine scissors to open the body cavity. Gently push the coil of the intestine aside and locate the reproductive organs. With fine forceps pick up one uterine horn and cut 0.5 cm above the point where the uterine horns separate. While holding the uterine horn, dissect away connective tissue attached to the uterine horn, uterine tube, ovary and ovarian fat pad. Place dissected reproductive tract in a dish with 6 ml sterile Phosphate Buffered Saline (PBS). Proceed with the second reproductive tract. Transfer the dish to a Biosafety cabinet and wash the tissues 3 times in 6 ml sterile PBS. Continue the work under a dissection microscope located in the Biosafety cabinet. Grab the uterine horn with fine tweezers and disconnect the uterine horn from the uterine tube by severing at the utero-tubal junction. Cut out the ovarian bursa surrounding the ovary by using a 25 G needle. Note: After the ovarian bursa has been removed, the dissection is complete and the individual uterine tube remains in the PBS solution. Transfer a single uterine tube in a 50 µl drop of PBS to a 3.5 cm dish and mince into 0.1 mm pieces using 28 gauge needles. Transfer to 200 µl digestion buffer 1 (Dulbecco's Modified Eagle's Medium (DMEM) F12 (Ham's) medium supplemented with 300 units ml-1 Collagenase and 100 units ml-1 Hyaluronidase) and incubate for 1 hr at 37 °C in a 5% CO2 incubator. After the incubation, add 1 ml 0.25% Trypsin-Ethylenediaminetetraacetic acid (EDTA) and suspend the solution with the help of a 1 ml pipette tip (aka blue tip) 20 times for 3 minutes. Add 5 ml + 4 °C DMEM/F12 (Ham's) medium containing 2% fetal bovine serum. Collect tissues by centrifugation (600 rcf, 5 min, room temperature (RT)), and add 1 ml digestion buffer 2 (DMEM F12 (Ham's) medium supplemented with 7 mg ml-1 Dispase II and 10 µg ml-1 Deoxyribonuclease I (DNase I)). Suspend tissue pellet 20 times with help of a 1 ml pipette tip. Add 5 ml serum free complete mouse tubal epithelium growth medium (M-TE-GM, Table 1). Collect cells by centrifugation (600 rcf, 5 min, RT). Add 1 ml M-TE-GM, suspend and count cells by hemocytometer. Seed 1 x 105 cells in 1 ml per well in a 24-well low attachment plate and incubate in M-TE-GM at 37°C in a 5% CO2 incubator for 4 days. Change the medium every day. Prepare single cell suspensions of cultured primary suspension TE cells from β-actin-EGFP or β-actin-DsRed mice. Collect TE suspension cultures from 24-well low attachment plates. Centrifuge (600 rcf, 5 min, RT), and suspend cell pellets with 1 ml 0.25% Trypsin-EDTA. Incubate for 10 min at 37°C in a 5% CO2 incubator. Stop trypsin activity by adding 5 ml DMEM/F12 (Ham's) medium containing 5% fetal bovine serum. Collect cell pellets by centrifugation (600 rcf, 5 min, RT). Wash cell pellets twice with 4 ml of cold PBS (4°C), add 1 ml PBS per cell pellet, and suspend. Count cells by hemocytometer and transfer to 1.7 ml centrifugation tubes. Working on ice, add 1 x 105 cells to 10 µl PBS, then add 10 µl basement membrane matrix. Suspend and transport on ice to the animal room. Note: Perform all dissection and tissue culture work in a Biosafety cabinet under sterile conditions. Separately grow lentivirus-EGFP and -mCherry labeled human immortalized ovarian surface epithelium cell lineHIO118 until 80 - 90% confluency on 10 cm dishes at 37°C in a 5% CO2 incubator. Wash dishes twice with 10 ml PBS, add 1 ml 0.25% Trypsin-EDTA per dish and incubate for 10 min at 37°C in a 5% CO2 incubator. Stop the reaction by adding 10 ml DMEM/F12 (Ham's) medium containing 5% fetal bovine serum. Collect cell pellets by centrifugation (600 rcf, 5 min, RT). Wash cell pellets twice with 10 ml of cold PBS (4°C), add 1 ml PBS per cell pellet, and suspend. Count cells by hemocytometer and transfer to 1.7 ml centrifugation tubes. Working on ice, add 1.0 x 106 Lenti-mCherry labeled cells + 1.0 x 106 Lenti-EGFP labeled cells to 10 µl PBS. Add 10 µl basement membrane matrix. Suspend and transport on ice to the animal room. 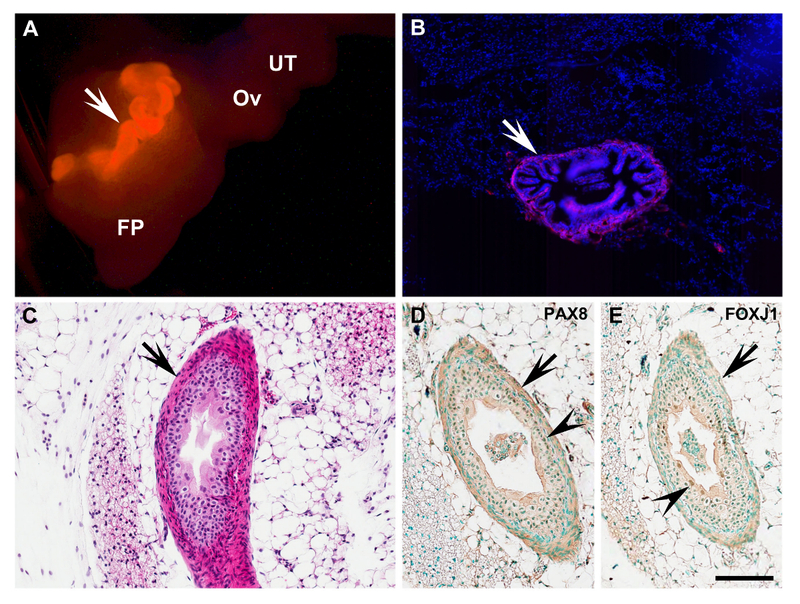 Dissect individual uterine tubes from 6- to 8-week old virgin β-actin-DsRed mice in PBS as described in steps 1.1.1-1.1.5. Transfer single uterine tubes into a 200 µl drop of PBS under a dissection microscope. Gently uncoil uterine tubes with the help of tweezers and 28 gauge needles by removing the mesosalpinx, a portion of the broad ligament which supports the segments of the uterine tube. Place single uncoiled uterine tubes in a drop of 200 µl ice-cold PBS until the recipient's ovarian fat pad is exposed and prepared to receive the transplant. Note: Disinfect instruments between each animal surgery. Prepare and arrange all equipment in advance. Dorsal transplantations to the right ovarian fat pad are preferential as this avoids the spleen. However, recipients may have transplants in both ovarian fat pads. Use syngeneic mice or severe combined immunodeficiency (SCID/NCr) mice as recipients of primary cells. For human cells, such as HIO118 cells, use Nod/SCID/gamma (NSG) mice or SCID mice. Anesthetize recipient mouse with a single intra-peritoneal injection of 2,2,2-Tribromoethanol at a dosage of 0.15 ml/10 g body weight. Place the animal on a heating pad, in the animal hood and confirm proper anesthetization by loss of pedal reflex (toe pinch). Apply vet ointment on eyes to prevent dryness while the animal is under anesthesia. Inject the animal subcutaneously with the analgesic Ketoprofen at a dosage of 4 mg/ g body weight to treat for post-surgical pain. Note: As an alternative, use isoflurane for anesthesia. Place the animal in the induction chamber and adjust the oxygen flowmeter to 0.8-1.5 L/min and the isoflurane vaporizer to 2-3%. Remove the anesthetized animal from the chamber, let it breathe isoflurane from a mask and set the oxygen flowmeter to 0.4-0.8 L/min and the isoflurane vaporizer to 1.5%, then start the surgery. Shave the surgical area with #40 clippers; remove hair from an area 2 times the surgical area, prepare the shaved skin with three antiseptic scrubs of povidone-iodine, followed by 70% ethanol, and cover with a sterile drape. Move the animal under a dissection microscope located in a Biosafety cabinet. Expose the reproductive tract by an incision in the dorsomedial position directly above the ovarian fat pad. Note: Critical step: Precise skin incision facilitates wound healing, the use of a scalpel is recommended in step 2.4. Using blunt fine forceps pull the ovarian fat pad carefully through the incision towards the midline, minimizing damage to nerves and major blood vessels. Critical Step: If bleeding occurs, stop the surgery and consider transplanting to a different host animal. Under the control of the dissection microscope with help of a 28 gauge beveled needle make a 2-4 mm deep incision into the ovarian fat pad, 3-4 mm above the ovary. Critical step: Ensure that the incision only goes through half of the fat pad; puncturing all the way through to the bottom side causes leakage. Be swift and proceed without delay after this step. For cell transplantations, fill a syringe (30 gauge needle) with 10-20 µl of the cell-basement membrane matrix-mixture and inject into the fat pad incision. For uterine tube transplantation, pick up the uterine tube with fine forceps and place in 10 - 20 µl basement membrane matrix kept on ice. Using a 0.1-10/20 µl XL graduated filter tip (shortened by 3 mm) pick up the tissue and basement membrane matrix suspension and release into the fat pad incision. Wait 5 minutes for the basement membrane matrix to solidify and place the reproductive tract back into the peritoneum. Close the muscles with 2 stiches of surgical suture and the skin with two small wound clips or surgical suture. Repeat steps 2.4-2.8 to transplant a PBS-basement membrane matrix-mixture into the contra-lateral fat pad of the animal which will serve as control. Critical step: After the surgery place the animal on a heating pad, because heat loss is rapid in anesthetized mice. Let animal recover on a heating pad in the native cage and observe the animal until fully awake from the anesthesia. Do not leave an animal unattended until it has regained sufficient consciousness to maintain sternal recumbence. Do not return an animal that has undergone surgery to the company of other animals until fully recovered. Place a handful of pre-wet food pellets inside the cage in addition to dry food on the cage after surgery. Apply post-surgical analgesics if needed for the next few days and examine the wound daily. Apply antibiotics according to the approved animal protocol if wound infection occurs. Remove wound clips 10 days after surgery when the wound has fully closed. Prepare 4% paraformaldehyde solution by mixing 26 ml ddH2O with 4 ml 10x PBS and 10 ml 16% paraformaldehyde solution. Dissect in one block, the engrafted ovarian fat pad, ovary, uterine tube, 0.5 cm uterus as described in steps 1.1.1-1.1.4. Immediately place in 2 ml 4% paraformaldehyde and fix for 2 hr, at RT. From the same animal, dissect the non-engrafted contralateral ovarian fat pad system transplanted with PBS-basement membrane matrix mixture as a control (see step 2.9). Fix and process in the same way. After fixation wash tissues three times with PBS for 5 min and incubate overnight in PBS at 4 °C. For the whole-mount imaging of the ovarian fat pad proceed to step 3.2.1. Note: After the image acquisition tissues can be frozen (3.3.1) or processed for paraffin embedding (3.3.2). Overnight incubation in 30% sucrose in PBS at 4 °C improves quality of frozen tissues. Place whole-mount ovarian fat pad systems in PBS filled dishes and image using an inverted microscope equipped with epi-fluorescence attachment and high-definition color camera, with 4, 10x objectives, and a stereomicroscope equipped with a fluorescence attachment, color camera and Plan Apo 1xWD70, ED Plan 1.5xWD45 objectives. Following whole-mount image acquisition (3.2.1) place a 200-500 µl drop of embedding medium for frozen tissue specimens on a 2 x 1 cm piece of laboratory film and using forceps, transfer the tissue to the drop. Pick up the film at one edge and transfer the tissue-medium drop to a 1.8 ml cryogenic vial. Close the vial and plunge into liquid nitrogen. Store frozen tissues at -80 °C. Alternatively, proceed with the standard paraffin embedding. Use 20-40 volumes of tissue volume for each step. Immerse tissues once in 65% ethanol for 30 min, shaking gently at RT. Immerse tissues once in 70% ethanol for 30 min, shaking gently at RT. At this stage samples can be stored for months at RT. Immerse tissues once in 90% ethanol for 30 min, shaking gently at RT. Immerse tissues once in 95% ethanol for 30 min, shaking gently at RT. Immerse tissues twice in absolute ethanol (200 proof) for 30 min, shaking gently at RT. Immerse tissues twice in chloroform for 30 min, shaking gently at RT. Immerse tissues once in paraffin for 30 min, shaking gently at 58 °C. Immerse tissues once in paraffin for 12 hr, shaking gently at 58 °C. Immerse tissues once in paraffin for 3 hr, at 58 °C. Place tissues in metal histology molds and fill molds with 58 °C paraffin. Add a plastic histology cassette on top of the paraffin and cool down paraffin to +4 °C. Extract paraffin-tissue block and store at RT. Note: Paraffin temperature should not exceed 58 °C for optimal preservation of tissue suitable for immunohistochemical staining. Alternatively, Prepare for the Paraffin Embedding with Specimen Processing Gel. Aspirate the PBS and transfer whole-mount tissues to 70% ethanol. Incubate at room temperature for 2 hr. In a water bath, preheat specimen processing gel to 60 °C. Pipette 200 µl of the specimen processing gel onto a laboratory film-lined Petri dish. Using fine dissection forceps transfer the whole-mount tissue system to the specimen processing gel drop. Allow the specimen processing gel plug to solidify at room temperature, or solidify the plug for 10 min at 4 °C. Place the specimen processing gel embedded tissue in histology tissue cassettes sandwiched between biopsy foam pads. Embed in paraffin as in steps 3.3.2-3.3.2.10. Note: Specimen processing gel embedding prevents loss and allows preservation of small fragile tissue samples. Note: Tissues preserved by freezing or paraffin embedding are suitable for immunohistochemical staining14,15. Experimental cells and tissues can be accurately transplanted into the ovarian fat pad under a dissection microscope (Figure 1). The examples include primary mouse tubal epithelium cells derived from mice ubiquitously expressing EGFP (Figure 2A) or DsRed (Figure 2B) and human immortalized ovarian surface epithelium cells HIO11816,17cells labeled with mCherry and EGFP lentiviruses (Figure 2C-F). The approach is also applicable for long-term transplantation of organs, such as the mouse uterine tube (Figure 3). According to immunohistochemical staining, both ciliated (FOXJ1 positive14) and secretory (PAX8 positive15) cells are preserved in the tubal epithelium of transplanted tissues (Figure 3D and E). Figure 1: Ovarian Fat Pad Transplantation. (A) Exposed area of transplantation (arrow). (B) An incision is made by a 28 G needle (arrow). (C) UT/basement membrane matrix mixture engraftment by pipette tip (arrow). (D) UT engrafted (arrow, bright red, UT of β-actin-DsRed mice). FP, fat pad; Ov, ovary; UT, uterine tube. Scale bar = 2 mm. Please click here to view a larger version of this figure. Figure 2: Detection of Transplanted Mouse Primary Tubal Epithelium Cells and Human Immortalized Ovarian Surface Epithelium Cells. (A, B) Outgrowths of primary mouse tubal epithelium cells (arrows) of β-actin-EGFP mice (A, green) and β-actin-DsRed (B, red) 8 days after transplantation into a syngeneic mouse. (C, D) Engraftments of mixed HIO118 cells (arrows) labeled with either Lenti-EGFP (green) or Lenti-mCherry (red) 10 days after transplantation into NSG mice. (D) Enlarged area from (C, arrow). (E, F) Graft developed 43 days after transplantation of the same cells as in C, D to SCID mouse (arrows). A-D, F, fluorescence; E, bright field, FP, fat pad; Ov, ovary; UT, uterine tube. (A, B, D-F) Scale bar = 500 µm; (C) Scale bar = 1,600 µm. Please click here to view a larger version of this figure. Figure 3: Characterization of Uterine Tube Transplant. (A) Complete uterine tube (arrow) of β-actin-DsRed mouse 6 days after transplantation into the ovarian fat pad (arrow, bright red). (B) Fluorescent frozen section of the fat pad with transplant shown in (A). Red, DsRed; Blue, 4',6-diamidino-2-phenylindole (DAPI) nuclear counterstaining. (C) Uterine tube graft (arrow) 40 days after transplantation into NSG recipient mouse (arrow). Paraffin section. Note correct preservation of all principle uterine tube components, and lack of transplantation-associated fibrosis and inflammation. Hematoxylin and eosin staining. (D, E) Detection of tubal epithelium markers Paired-box gene 8 (PAX8) and Forkhead box J1 (FOXJ1; brown nuclear color, arrowheads) in cells of the graft (arrows) shown in (C). Immunoperoxidase system. Counterstaining with methyl green. FP, fat pad; Ov, ovary; UT, uterine tube. (A) Scale bar = 1,000 µm; (B) Scale bar = 200 µm; (C-E) Scale bar = 100 µm. Please click here to view a larger version of this figure. Table 1: Mouse Tubal Epithelim Growth Medium (M-TE-GM). Components listed in the left column are dissolved in 1x DMEM F12 (Ham's) medium at the indicated concentrations, right column. The final medium composition is serum free. We have established an ovarian fat pad transplantation assay which allows for the accurate delivery and detection of epithelial cells and tissues. The ovarian fat pad assay transplantation procedure is less technically challenging than intrabursal injection10-12 and allows for more uniform and precise location of transplanted cells as compared to intraperitoneal injection9. It is also well suited for long-term transplantation of an entire organ, such as the uterine tube. Importantly, the ovarian fat pad provides a familiar microenvironment for epithelia of the female reproductive system. It should be particularly suitable for studies of the molecular and cellular properties of human and mouse ovarian and tubal epithelium cells during regeneration and malignant transformation. In contrast to other organs, few studies have focused on identification and characterization of stem cells in the epithelia of the female reproductive tract18,19. Such studies are of particular importance because many cancers are believed to originate from adult stem cells20. Yet cellular origins of epithelial ovarian cancers remain highly debatable18. Epithelial ovarian cancers account for the majority of ovarian cancers and is in 5th place among all cancer related deaths of women in the US21. Thus development of an orthotopic assay with several advantages over the existing transplantation techniques9-12 should greatly facilitate studies in this area. Given the superficial location of the ovarian fat pad, small animal imaging systems can be used to follow up on engraftments labeled with strong fluorescent or bioluminescent reporters. It also should be possible to establish minimally invasive high resolution live imaging assays, such as non-linear microscopy22. The ovarian fat pad can also be kept in organ cultures, thereby allowing three-dimensional culture of normal and neoplastic epithelia under conditions closely recapitulating the organization of cells and the extracellular matrix. Future studies should address these promising possibilities. Several critical steps have to be considered. Providing a heating pad and keeping rodents warm during surgery improves greatly the survival rate. Sterility of instruments handling the fat pad ensures that the engrafted systems are kept sterile. In our experience, significant bleeding results in growth retardation of transplants. Importantly, the fat pad incision should be made precisely because tearing the fat pad or puncturing it through causes bleeding. Coagulants should be used to stop bleeding as necessary. If engraftments do not develop, a higher concentration of injected cells should be considered. The first successful outgrowths can be observed as early as one week after the transplantation and most engraftments should be visible one month after the procedure. For transplantation, needles with larger diameter (23-25 G) can be used to prevent shearing of large cells (over 10 µm in diameter). However, such needles may be more traumatic to the fat pad and their use should be tested in advance. For our experiments we have used 6 to 8 week old donor and recipient mice. For both purposes younger or older mice can be used. However, the number of injected cells may need to be adjusted. The smaller size of ovarian fat pads in younger donors will also need to be considered. As with any methods, there are some limitations of the mouse ovarian fat pad transplantation assay. Although syngeneic immuno-competent mice can be used for murine primary cells/tissues, our technique requires NSG or SCID mice for transplantation of human material. 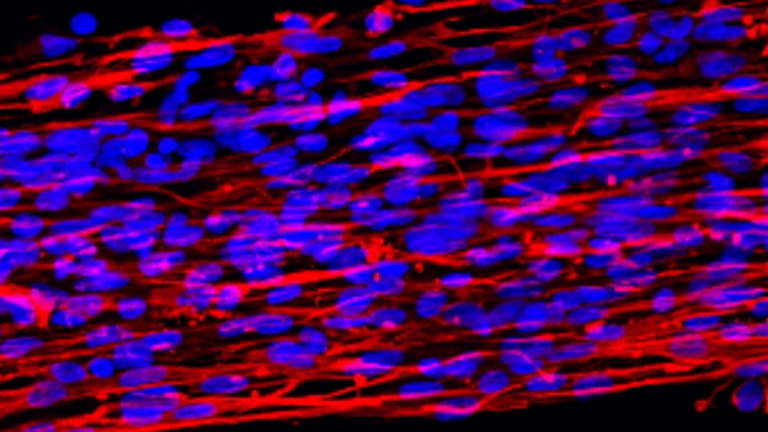 It is likely possible to humanize the fat pad to support the growth of human epithelial cells. However, we have not tested this approach yet. Use of younger females may to lead to lower breeding costs; however, mature virgin female mice (age 8 to 10 weeks) have a larger fat pad, thereby allowing transplantation of larger specimens. Finally, laboratory personnel should be trained in animal surgery to ensure timely and successful execution of the procedure. We would like to thank Dr. Andrew K. Godwin, University of Kansas Medical Center, for providing the human cells HIO118. These studies were supported by the grants from the New York Stem Cell Program (NYSTEM; T028095) and National Institutes of Health/National Institute of Child Health and Human Development (P50HD076210) to AFN, and by the grants from NYSTEM (C028125, C024174 and T028095), National Institutes of Health/National Cancer Institute (CA182413) and Ovarian Cancer Research Fund (327516) to AYN. Deome, K. B., Faulkin, L. J., Bern, H. A., Blair, P. B. Development of mammary tumors from hyperplastic alveolar nodules transplanted into gland-free mammary fat pads of female C3H mice. Cancer Res. 19, 515-520 (1959). Proia, D. A., Kuperwasser, C. Reconstruction of human mammary tissues in a mouse model. Nature protocols. 1, 206-214 (2006). Shackleton, M., et al. Generation of a functional mammary gland from a single stem cell. Nature. 439, 84-88 (2006). Stingl, J., Caldas, C. Molecular heterogeneity of breast carcinomas and the cancer stem cell hypothesis. Nat Rev Cancer. 7, 791-799 (2007). Koren, S., et al. PIK3CA(H1047R) induces multipotency and multi-lineage mammary tumours. Nature. 525, 114-118 (2015). Nikitin, A. Y., Nafus, M. G., Zhou, Z., Liao, C. -P., Roy-Burman, P. Prostate stem cells and cancer in animals. Stem Cells and Cancer. Bagley, R. G., Teicher, B. A. Humana Press. New York, NY. 199-216 (2009). Boj, S. F., et al. Organoid models of human and mouse ductal pancreatic cancer. Cell. 160, 324-338 (2015). Lu, C. P., et al. Identification of stem cell populations in sweat glands and ducts reveals roles in homeostasis and wound repair. Cell. 150, 136-150 (2012). Flesken-Nikitin, A., et al. Ovarian surface epithelium at the junction area contains a cancer-prone stem cell niche. Nature. 495, 241-245 (2013). Orsulic, S., et al. Induction of ovarian cancer by defined multiple genetic changes in a mouse model system. Cancer Cell. 1, 53-62 (2002). Dawes, J., Liu, B., Mars, W., Michalopoulos, G., Khillan, J. S. Multiple ovarian transplants to rescue a transgenic line of mice. Lab Anim (NY). 39, 191-193 (2010). Cordero, A. B., Kwon, Y., Hua, X., Godwin, A. K. In vivo imaging and therapeutic treatments in an orthotopic mouse model of ovarian cancer. Journal of visualized experiments : JoVE. (2010). Albihn, A., et al. Production of capsular material by equine trophoblast transplanted into immunodeficient mice. Reproduction. 125, 855-863 (2003). Muthusamy, N., Vijayakumar, A., Cheng, G., Ghashghaei, H. T. A knock-in Foxj1(CreERT2::GFP) mouse for recombination in epithelial cells with motile cilia. Genesis. 52, 350-358 (2014). Perets, R., et al. Transformation of the fallopian tube secretory epithelium leads to high-grade serous ovarian cancer in Brca;Tp53;Pten models. Cancer Cell. 24, 751-765 (2013). Capo-Chichi, C. D., et al. Dynamic alterations of the extracellular environment of ovarian surface epithelial cells in premalignant transformation, tumorigenicity, and metastasis. Cancer. 95, 1802-1815 (2002). Roland, I. H., et al. Loss of surface and cyst epithelial basement membranes and preneoplastic morphologic changes in prophylactic oophorectomies. Cancer. 98, 2607-2623 (2003). Flesken-Nikitin, A., Odai-Afotey, A. A., Nikitin, A. Y. Role of the stem cell niche in the pathogenesis of epithelial ovarian cancers. Mol Cell Oncol. 1, 963435 (2014). Ng, A., Barker, N. Ovary and fimbrial stem cells: biology, niche and cancer origins. Nat Rev Mol Cell Biol. 16, 625-638 (2015). Visvader, J. E. Cells of origin in cancer. Nature. 469, 314-322 (2011). Siegel, R. L., Miller, K. D., Jemal, A. Cancer statistics, 2015. CA Cancer J Clin. 65, 5-29 (2015). Williams, R. M., et al. Strategies for high-resolution imaging of epithelial ovarian cancer by laparoscopic nonlinear microscopy. Transl Oncol. 3, 181-194 (2010).